The title of Sandy Baldwin’s book The Internet Unconscious. On the Subject of Electronic Literature, published last year, suggests that reflections on writers of e-literature and hypertext or algorithmic works are in store for the reader. Such works have a growing circle of close readers who use a remarkably specialized metalanguage, joining terms from poetics with numerous concepts created solely to fit this newly emergent artistic domain, as well as extremely abundant terminology from programming and computer technology. This unavoidable linguistic conglomeration, requiring staggering qualifications, sometimes gives the impression of an exclusive coterie jargon for the initiated, but as we quickly learn upon opening the book, Baldwin has spared readers much of the annoyance relating to such jargon; his book does not deal with electronic literature as described above, but with the writing performed by each and every Internet user. He pronounces the script activity deployed by all e-mailing, tweeting or in-logging subjects to be a new kind of writerly practice, out of which new forms of literature are issuing or can issue. The title’s promise of illuminating online script practices through psychoanalytic theory, offering a chance for new knowledge of the unconscious to accrue from electronic writing, makes Baldwin’s project that much more attractive. The book’s egalitarian vision of electronic writing invites readers to learn about certain elements of the computer and IT engineering that participate in the literature developing via Internet user activity. The point is to become acquainted with the apparatus hidden beneath the carefully cultivated impression that using the net is a natural or intuitive process. Thanks to his very accessible scientific description, electronic “lovers of literature,” as Baldwin calls them, can learn, for example, how their online activity and electronic communication are mediated by the program Ping, which checks the quality of internet connections (Baldwin even writes of “Ping poetics”). Readers will likewise learn about the command that changes access permissions to Chmod-777 files, plaintext, and leetspeak, an alternative alphabet used to sneak past internet prohibitions (for example against vulgarisms) which is evolving at lightning speed to keep up with the hacker vernacular. Its propaedeutic value is merely a fringe benefit of the tale Baldwin has to tell; his primary task is to define the subject of electronic literature in two ways at the same time, both of which relate differently to the question of the unconscious. Firstly, there is the subject of ecstatic writing, who is revealed through the love of literature that is exploding with new and unexpected force in our time. Baldwin observes that the emergence, in relation to this subject, of a literariness still not fully mastered attracts attention from all web users and constitutes a conscious or, more often, unconscious impulse toward electronic writing. Secondly, however, the same subject, who belongs to the circle of “lovers of literature,” is simultaneously seized by the mechanisms of technological control referred to above; his activity is constantly subject to regulations of programs, protocols, files, tests, rendering him a Foucaultian subject located in a particular place and hired to perform activities that bring profits to someone else. Seen from this perspective, the “lover of literature,” due to his imaginative overinvestment relating to the hope he sees in online writing, propels forward – consciously or unconsciously – the various business interests of managers and system administrators. His body should be seen as a “zombie shell” passively adapting to the demands and commands of electronic devices, since in fact it only does what particular monitoring programs permit. In this tangle of new hopes and new traps, we find the literariness of electronic writing, which Baldwin is trying to define more precisely. Moreover, the work that materializes in this “somewhere” is subject to the deconstructive work of de-semination. Baldwin elucidates the main parameters of the electronic literature written by each ordinary Internet user by means of Derridean categories. Towards the end of the book he clearly states that the activity of those who write, who are losing their right to the text, to its singularity, to sign it with their names, possesses a few modest traits that elude the distorting processes of their dispossession from literature. Above all, they play according to the principles of the Derridean secret – they co-create literature understood as a secret, they acknowledge the secrecy that makes written literature possible, but because they themselves do not know that secret (for then it would be none), nobody can ultimately disinherit them of their right to its mystery. The secret circulates freely in their writing. Baldwin says the same thing, mutatis mutandis, with regard to the reclamation of intimacy by those logged in to Second Life, and the situation is very similar when it comes to thinking about the Internet as a literary work, since that work is rescued by the logic, familiar from Derrida’s essay on Jabès, of the advent of a book outside the book. Up to a point. Actually, the little ex anima deconstructionist salvation of the writers of internet literature produced at the ending reveals the weakness of Baldwin’s project more than any of its strengths. I would define my main reservation about his proposal in the following terms: the project is too deconstructionist, and not psychoanalytical enough. An ill-disposed reader might even complain that The Internet Unconscious contains a lot of fairly obvious assertions about the subject who logs into programs, sends electronic letters, passes CAPTCHA tests, together with loose essayistic remarks in the manner of De Man or Derrida’s writings. In fact, the book does not take us far beyond the horizon demarcated by post-Structuralism with Foucault’s critique of systemic power and the panopticon, with the distorting concepts of all kinds of essentializing illusions about the subject and writing and the hopes, typical for late Deconstructionism, invested in plans for literature as secret, friendship and hospitality. Perhaps in the end some reflections that extracted more radical conclusions from the writings of Derrida would allow the book to get past this all-too-familiar and today strikingly inert and stale paradigm. 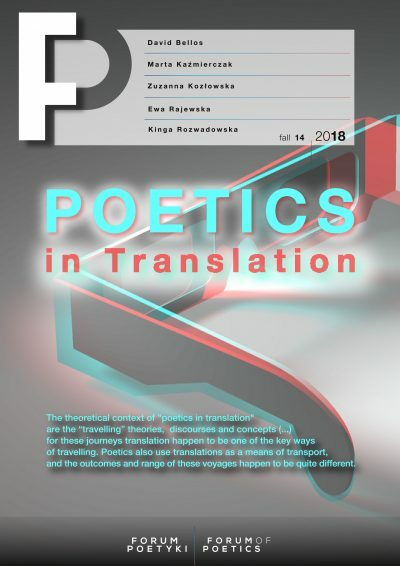 The critical analysis promised in the title of the unconscious of electronic literature’s subject boils down to some eclectic use of selected psychoanalytical concepts. They pop up extemporaneously as references to Freud’s work on mourning and melancholia, Bellmer’s extravagant (and fascinating) ideas on the unconscious of the body, Kristeva’s chora and her concept of the abject, Lacan’s belief that the unconscious is (structured) “like a language.” Furthermore, the subject of the “Internet Unconscious” mentioned in the title is a paraphrase of a term from a well-known work by Rosalind Krauss, who wrote of the “optical unconscious” of the modernist artist. Something unexpected has occurred, then – the book’s crucial question of the subject of the “Internet Unconscious” managed to get discussed without any reference or response whatsoever to the many existing theories of the unconscious as it operates in the subject functioning in cyberspace. And the truth is that it is something of a commonplace in today’s humanities classes that the subject of online activity is enmeshed in specially structured desires, fantasies, virtualities or identity masks (avatars), in descriptions of which various forms of psychoanalytical thought and their terminologies occupy a privileged place. To clarify the consequences of this astonishing omission, let us consider one of the oldest books to analyze the unconscious of the active (again, writing) subject online. In The Plague of Fantasies, published in 1997, Slavoj Žižek perversely remarks that the subject overinvesting his existence in cyberspace is usually not tormented by anxieties of being too phantom (or “zombie” in Baldwin’s terms), but rather of not being phantom enough. This means that the web not only sweeps us toward a virtual state, but introduces new rules by which a newly intensified conflict is played out between the mechanisms of fantasy and confrontations with non-virtual experience, which disrupt these mechanisms. Other psychoanalytic theorists of cyberspace cited by Žižek underscore that the difference between the virtual and “real” worlds is not nearly as important as the tension – more difficult to grasp but singularly alive in the experience of online subjectivity – between phenomena and semblances of them. A semblance, which is a form of virtuality, is submerged in an illusory self-contained presence in the worlds depicted, whereas a phenomenon represents a reflection of something, whose extraction from it requires at least a minimum amount of thought, requiring us to maintain a modicum of distance from it and be prepared to engage it critically. This approach also proves useful for thinking about the subject of electronic literature, which may not necessarily always imaginatively overinvest in its writing, but is sometimes not so much absorbed by the online semblance of simulated worlds, as attentively observing how the an internet phenomenon can provoke writing which remains intense but also be simultaneously critical, revelatory, and creatively formulate subjective existence in an electronic context. Žižek’s further reflections are also instructive. He reformulates Wittgenstein’s maxim “Whereof one cannot speak, thereof one must be silent” as “Whereof one cannot speak, thereof one must write.” The writing of electronic literature is revealed in this perspective as an opportunity not only to express matters that are too intimate or too painful, but to relay them to the addressee in a conversation. Žižek has in mind primarily the relationship of the person writing to his most internalized and unconscious prohibitions and limitations. They possess a fundamental fantasy, which makes it impossible to perceive even that which appears to us to be the subject’s natural environment, constructed by sensory receptors; this remains inaccessible and foreign to him. The most shocking thing of all may be accepting that an irremovable discrepancy exists between what appears to us to be the milieu of our existence and what it is in reality; for this reason, the subject must time and time again perceive itself as an uncanny object of incomprehensible operations, which it undergoes without any control or knowledge thereof. By the same token, through writing in cyberspace we can dare to confront Lacan’s famous Real, the startling and traumogenic truth about the subject, and thereby acquire a kind of self-knowledge enabling effective joint decision-making about the forms of activity we engage in as subjects online. I will summarize these problems succinctly, because they prove that many years before Baldwin’s book, there were already psychoanalyses of the subject in the web, which indicated that the binary division between the internet “lover of literature” and the Foucaultian person put in place by the devices of power can frequently be discovered through the creation of electronic literature. The subject of this self-knowledge need not escape into Derridean games of the secrets of writing, but can fairly clearly recognize his dissociation, fraught as it is with uncanniness, and work on reorganizing the entire field in which his electronic writing practices take place. Baldwin reminds the reader of the political and legal circumstances in which successive regulations on electronic writing were instituted, for example, relating to ASCII and Unicode protocols, and others. We must add, however, that electronic writing is sometimes connected with a sharpened sensitivity to political and legal circumstances, to the whole infrastructure of power and economics, seen as imposing various re-orientations of the Internet’s parameters. This is precisely why writers of electronic literature (in Baldwin’s sense of those terms) took part in an effective street and internet protest campaign against the proposed ACTA regulation in 2011 and 2012. However much we demonize the dependency on mechanical protocols and directives of myriad system administrators, the subject who writes the Internet is able to learn and break codes, to work without remuneration on destroying administrative structures and disseminating coded data for the use of all. The examples of Wiki Leaks or Football Leaks place the writers of electronic literature beside past authors of banned books. The tireless negotiations on open access to certain data and the contravention of related norms sometimes considered to be harmful and unjustified result from the fact that the subjects writing electronic literature are able, in communities with greater or lesser degrees of transparency, to illuminate all the dimensions of their online presence. The constant threat that results from, for example, the enormous pressure by IT companies on Internet subjects has led those subjects, in the years since Žižek’s book was published, to become braver and more radically aware of their own fundamental fantasies, more inclined to dwell in the Reality of their internet entanglements and through their disentanglement attempting to claim the right to be lovers of literature often less than fully legal, if not simply illegal. Žižek’s book, invoked here as an example, has allowed me to demonstrate that Baldwin’s failure to include the stage of confronting his view of the unconscious of the subject of electronic writing with other works of psychoanalytic theory on the subject led him to overlook the activist dimension of the electronic literature he undertook to analyze. A dialogue with other works exploring theory of this type would no doubt have shed light on other omissions in his work. As a result, it appears that The Internet Unconscious, though it very boldly and affectionately calls every Internet user a writer, finally abandons that user amid some rather anachronistic imaginings on the flight of his unconscious into electronic writing. 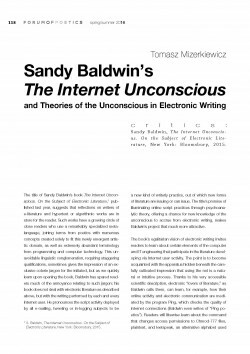 The article discusses Sandy Baldwin’s book The Internet Unconscious. On the Subject of Electronic Literature. The author takes note of the numerous deconstructionist threads in Baldwin’s work on the subject of electronic literature, and at the same time points to the absence of scrupulous discussion of previously developed concepts of the unconscious of the subject of online writing. One example of such a work is Slavoj Žižek’s The Plague of Fantasies, which the author uses to show some of Baldwin’s theoretical oversights and finally present the thesis that The Internet Unconscious is hindered by an anachronistic conceptual framework. S. Baldwin, The Internet Unconscious. On the Subject of Electronic Literature, New York: Bloomsbury, 2015. Slavoj Žižek, The Plague of Fantasies, London: Verso, 1997. See in particular the sections “Cyberspace, Or, the Unbearable Closure of Being,” 127-171.